Parents are being urged to read more to children as part of a new government parenting strategy in England. Those with literacy and numeracy problems will be offered help as their children start secondary school. Family learning courses will be tried out. Parents are also urged to play a bigger role in their child's education, under the Every Parent Matters strategy. 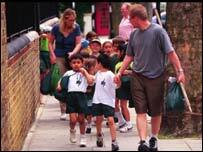 Education Secretary Alan Johnson said parenting had been a "no go" area for government but more people wanted help. He cited figures suggesting three quarters of parents would like advice on bringing up their children. Setting out the new strategy, Mr Johnson said one of the most important things a parent could do to boost their children's chances was to read to them. "Simple, yes - but in a busy world it doesn't happen enough. "Thirty per cent of parents don't read regularly with their children - a vital but missed opportunity to boost their children's development. "We watch an average of four hours television a day. If we read to children for just a tenth of this every day, we'd give their chances a massive boost." A National Year of Reading to start in 2008 would, he hoped, bring about another "step change" in attitudes to reading for purpose and pleasure. This would be aimed at everyone from toddlers to grandparents, and avid readers to the less enthusiastic. "Reading opens up a world of opportunities and books are the foundation on which we can build other learning. "Reading should be a source of pleasure in itself, as well as an essential support for increasing the life chances of children." Extra advice and support is also being offered to parents with numeracy and literacy problems, encouraging them to participate in learning activities with their children. Local authorities will be trained to offer advice sessions to parents whose child is entering primary or secondary school, which in turn will be urged to set up Parent Councils to give parents more of a voice. And more parents of children identified to be at risk of developing behavioural, emotional or social difficulties will be supported through early intervention projects run through extended schools. The strategy urges fathers, and working parents, to be more involved with their children. Activities that are offered to working parents outside office hours are also given prominence. The role of fathers in particular has been the subject of much media attention in recent weeks after a number of young people were killed in gun and gang violence. Schemes highlighted by Mr Johnson include one where fathers work with their children on allotments, visit sports facilities or take part in music projects. Mr Johnson said the parenting strategy had to be "bias-free", adding: "It's what parents do, not who they are, that makes the difference."